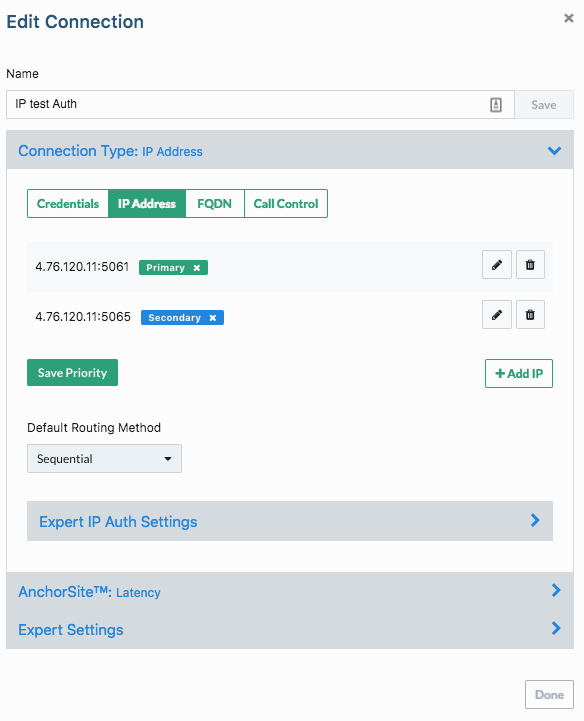 NOTE: Fail over connection/service can be set only when we use multiple IP authentications in a single connection. 1) Goto "connections" tab on the portal. 2) Create a new connection "Add Connection". 3) Enter the details and add both the IP's which you want to use. One will be primary IP address and second one is the secondary. NOTE: You can set the priority between or more IP's by using "Set Priority"
4) After adding the IP's, please click on "Save All Changes". This will save the configuration of the connection. 6) Click on "Basic Options" which is on the connection. This will open a new popup window with details of the connection. 7) Goto "Inbound" option. Now we need to set the time in "No Answer Timeout". 8) Click on "Save All Changes" option. This will save the connection configuration. 9) Go to "Numbers" tab and click on "Settings" -> "Routing". 10) Make sure that number has both primary and secondary IP. If you don't see the secondary IP address, please re-assign the connection to the number.